I go through phases in reading books. At the moment I am reading about my favorite period in history: between the wars and the glittering generation that changed the way we think about living. Thought-provoking stuff. Let’s get this out in the open: it is funny, with Rabelaisian moments, even. It is also a comic novel for our times. Especially when we read of the alleged fraud perpetrated by London antiques dealer John Hobbs, and the nightly escapades of ‘celebutantes’ famous for being … famous. 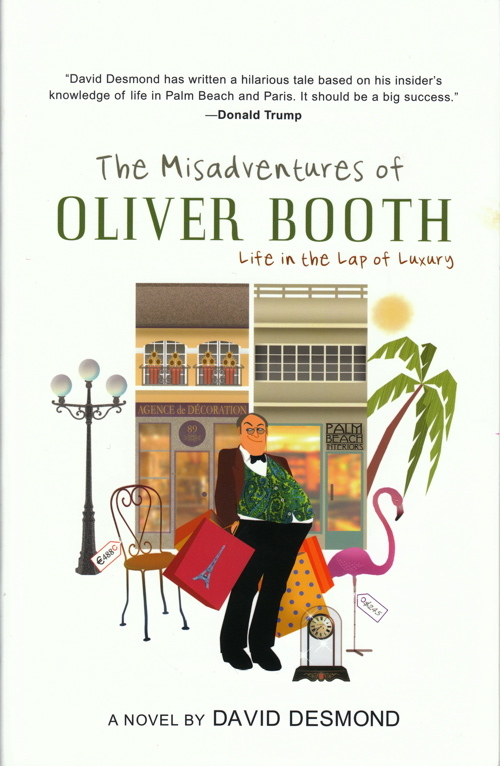 The Misadventures of Oliver Booth is a novel about shortcuts. The protagonist Booth is a social climber clinging to the side of a building just off the wealthier shopping thoroughfare of Worth Avenue in Palm Beach, Florida. Worthless, in every sense of the word. He longs to belong to the set that decorates the better houses in Palm Beach, but his ‘antique shop’ is filled with cheaply made ‘reproductions of classic French designs.’ He is a horrible employer, grotesque in appetite and deportment, and not much of a decent person in general. If he didn’t have bad taste, as the saying goes, he wouldn’t have any taste at all. No one would enter his shop without stumbling into it or bother to take a second glance at the inventory if he did. Fortunately for Booth, that is exactly what happens as he makes the acquaintance of the grandson of one of the doyennes of Palm Beach society who sends Booth and a French waiter with a good eye to Paris to outfit her guest house. Booth hopes to get rich quick, not really knowing his antiques (although he subscribes to all the magazines,) not speaking the language and not willing to listen. His newly-minted colleague Bernard Dauphin (the French word for the heir apparent to the throne…) is destined to make good. And he does it by being honest, hard-working, and French. Yes, he has a good eye, but he also advances largely through being in the right place at the right time. And why not? The American motto may be e pluribus unum but I bet I could make a strong case for carpe diem in this land of opportunity. Since we’re on the subject of Latin phrases, I leave you with one more: caveat emptor, ‘let the buyer beware;’ you may get sucked into reading and not want to stop. Or you may recognize yourself in one of the composite caricatures. No one escapes Mr. Desmond’s satiric gaze and that is what makes for a fun romp. Even the glimpses that we catch of Palm Beach society don’t really make you long for inclusion in the social clubs so much as for the kind of money that lets you go on buying trips to Paris to furnish your guest house. At any rate, Mr. Desmond has written and published a novel that gives us a café table view of a certain segment of society that always intrigues us. Tough times sometimes call for light measures … this is a book that can make you smile. This entry was posted in The Emporium and tagged Comic Novels, David Desmond, Oliver Booth, Palm Beach Florida, Paris France, Rabelais, Voltaire. Bookmark the permalink. As “Aristotle” said, “The only animal that laughs is human. I love a good read and a chuckle. Am most definitely going to get this book as I am in dire need of diversion and amusement at this time. Another book along these lines that I highly recommend is “Snobs” by Julian Fellowes. A clever and witty (and inciteful) novel of love and manners among the country house set (and those who aspire to join) in modern-day England, and the consequences (largely unexpected and often excruciating) of choices made. Written by the author of Gosford Park, so has much of that film’s deliciousness. Reggie, “Snobs” is a delight. As is Julian Fellowes. He makes a number of appearances in movies, too. This sounds like a delight. I often dip into James Thurber when I’m feeling bleak. You might also like The Uncommon Reader, by Alan Bennet. Truly a small, wry gem. Other recommendations along these lines, but from an earlier time include “Love in A Cold Climate” by Nancy Mitford, and any of the Mapp & Lucia books by EF Benson. I once made a scene of myself on an airplane reading one of the M&L books, weeping with uncontrollable laughter. Reggie, Booth is a lighter version, but has some really wonderful turns of phrase. Haven’t read the Mitford (but keep bumping into her in the biographies I’m reading and can’t wait to get into “Rebels and Hons”), but have some Mapp & Lucia which was endlessly entertaining. Pamela, Thurber makes Mrs. E. and me weep with laughter. His old fashioned Christmas story is compulsory reading at the holidays. I’ll look into the Bennet, thanks! I’m the author of The Misadventures of Oliver Booth and I wanted to thank you for having taken the time to read my book and then write such a careful and engaging review (I’m also happy that you liked it). As I’m sure you know, the wheels of the publishing business grind very slowly (when they grind at all). For that reason, I’ve started a blog, which should help to keep me motivated as I wait for the sequel to my book (which is completed and follows Oliver Booth to New York where he becomes involved in the world of high-end real estate) to be published and complete the third book in the series. Yes, there are too many blogs, but I’ve tried to make it interesting to the reader by posting in the voices of the characters from my book. Thus, Oliver Booth posts on Mondays about life in Palm Beach, Bernard Dauphin posts on Wednesdays about life in Paris, and I post on Fridays on a variety of topics. The blog is located at http://therichlife.wordpress.com. I hope you like it!